Crochet these fun slippers from Bernat Yarns in multi-colors. The granny square motif is easy to make. Once you make one pair of slippers you can make many more. Give these as stocking stuffers at Christmastime. Size 5 mm (U.S. H or 8) crochet hook or size needed to obtain gauge. GAUGE: 16 sc and 17 rows = 4 ins [10 cm]. With MC, ch 5. Join with sl st to first ch to form a ring. 1st rnd: Ch 3 (counts as dc). Work 17 dc in ring. Join with sl st to top of ch 3. 18 dc. Break MC. 2nd rnd: Join B with sl st to any dc. Ch 2. (Yoh and draw up a loop) twice in same st. Yoh and draw through 4 loops on hook. Yoh and draw through rem 2 loops on hook – counts as cluster. *Ch 1. (Yoh and draw up a loop) 3 times in next dc. Yoh and draw through 6 loops on hook. Yoh and draw through rem 2 loops on hook – cluster made. Rep from *around, ending with ch 1. Join with sl st to top of ch 2. Break B. 3rd rnd: Join A with sl st to any ch-1 sp. Ch 3 (counts as dc). 1 dc in same sp. *5 dc in next ch-1 sp. (2 dc in next ch-1 sp) twice. Rep from * 4 times more. 5 dc in next ch-1 sp. 2 dc in last ch-1 sp. Join with sl st to top of ch 3. Fasten off. Work as for Motif A to end of 2nd rnd. 3rd rnd: Join A with sl st to any ch-1 sp. Ch 3 (counts as dc). 1 dc in same sp. 2 dc in next ch-1 sp. *5 dc in next ch-1 sp. (2 dc in next ch-1 sp) twice. Rep from * twice more. (2 dc. 1 hdc. 2 sc) in next ch-1 sp. (2 sc in next ch-1 sp) 5 times. (2 sc. 1 hdc. 2 dc) in last ch-1 sp. Join with sl st to top of ch 3. Fasten off. 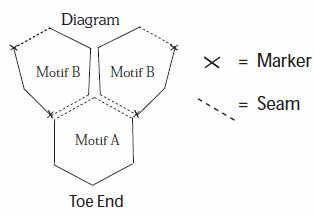 Join Motifs tog as shown in diagram to form 2 uppers. 1st rnd: Beg at center back heel seam, join MC with sl st. Ch 1. 1 sc in same sp. Work 1 sc in back loop of each st around. Join with sl st in first sc. 68 sc. 2nd rnd: Ch 1. 1 sc in first sc. Draw up a loop in each of next 2 sc. Yoh and draw through all loops on hook - sc2tog made. (1 sc in next sc. Sc2tog) twice. 1 sc in each of next 16 sc. (Sc2tog. 1 sc in next sc) 6 times. 1 sc in each of next 16 sc. (Sc2tog. 1 sc in next sc) 3 times. Join with sl st to first sc. 56 sc. 3rd rnd: Ch 1. 1 sc in each sc around. Join with sl st to first sc. 4th rnd: Ch 1. (1 sc in next sc. Sc2tog) 3 times. 1 sc in each of next 10 sc. (Sc2tog. 1 sc in next sc) 6 times. 1 sc in each of next 10 sc. (Sc2tog. 1 sc in next sc) 3 times. Join with sl st to first sc. 44 sc. 5th rnd: As 3rd rnd. 6th rnd: Ch 1. (1 sc in next sc. Sc2tog) twice. 1 sc in each of next 10 sc. (Sc2tog. 1 sc in next sc) 4 times. 1 sc in each of next 10 sc. (Sc2tog. 1 sc in next sc) twice. Join with sl st to first sc. 36 sc. 7th rnd: Ch 1. (1 sc in next sc. Sc2tog) twice. 1 sc in each of next 6 sc. (Sc2tog. 1 sc in next sc) 4 times. 1 sc in each of next 6 sc. (Sc2tog. 1 sc in next sc) twice. Join with sl st to first sc. 24 sc. Fasten off. Sew flat sole seam. 1st rnd: Ch 4 (counts as tr). Work 17 tr in ring. Join with sl st to top of ch 4. 18 tr. Break MC. Work 2nd and 3rd rnds as for Motif A of Child’s Version. Do not fasten off. 4th rnd: Ch 1. 1 sc in same sp as last sl st. 1 sc in each of next 3 dc. 3 sc in next dc. *1 sc in each of next 8 dc. 3 sc in next dc. Rep from * to last 4 dc. 1 sc in each of last 4 dc. Join with sl st to first sc. Fasten off. 1st rnd: Ch 4 (counts as tr). Work 17 tr in ring. Join with sl st to top of ch 4. 18 tr. Work 2nd and 3rd rnds as for Motif B of Child’s Version. Do not fasten off. 4th rnd: Ch 1. 1 sc in same sp as last sl st. 1 sc in each of next 5 dc. *3 sc in next dc (corner). 1 sc in each of next 8 sts. Rep from * twice more. 3 sc in next st, placing marker on center st (corner). 1 sc in each of next 14 sts. 3 sc in next st, placing marker on center st (corner). 1 sc in each of last 5 sts. Join with sl st to first sc. Fasten off. 1st rnd: Beg at center back heel seam, join MC with sl st. Ch 1. 1 sc in same sp. Work 1 sc in back loop of each sc around. Join with sl st in first sc. 80 sc. 2nd rnd: Ch 1. 1 sc in first sc. Draw up a loop in each of next 2 sc. Yoh and draw through all loops on hook - sc2tog made. (1 sc in next sc. Sc2tog) twice. 1 sc in each of next 19 sc. (Sc2tog. 1 sc in next sc) 8 times. 1 sc in each of next 19 sc. (Sc2tog. 1 sc in next sc) 3 times. Join with sl st to first sc. 66 sc. 4th rnd: Ch 1. (1 sc in next sc. Sc2tog) 3 times. 1 sc in each of next 12 sc. (Sc2tog. 1 sc in next sc) 8 times. 1 sc in each of next 12 sc. (Sc2tog. 1 sc in next sc) 3 times. Join with sl st to first sc. 52 sc. 6th rnd: Ch 1. (1 sc in next sc. Sc2tog) twice. 1 sc in each of next 11 sc. (Sc2tog. 1 sc in next sc) 6 times. 1 sc in each of next 11 sc. (Sc2tog. 1 sc in next sc) twice. Join with sl st to first sc. 42 sc. 7th rnd: Ch 1. (1 sc in next sc. Sc2tog) twice. 1 sc in each of next 9 sc. (Sc2tog. 1 sc in next sc) 4 times. 1 sc in each of next 9 sc. (Sc2tog. 1 sc in next sc) twice. Join with sl st to first sc. 34 sc. Fasten off. Sew flat sole seam. 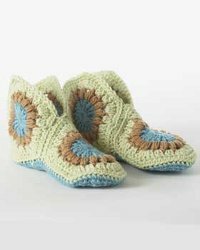 If you liked this free crochet slipper pattern, we have lots more in our 14 Cozy Crochet and Knit Slipper Patterns collection. I'm amazed how neat they make this multi color granny slippers. I've always admired the workmanship of these crochet slippers, you thought they were molded from shoe lasts. I have a big foot! How would I enlarge this to a size 10-11? I clicked on these because it said super easy. They are so cute. Reading the instructions, they are not easy to me, and not sure how to be able to make them for a ladies size 10. Does anyone have a similar easier pattern they could share using granny squares? I"m working on these slippers and they are not all that easy. I am an experienced crocheter too....I love the look of them, but I found several areas of the pattern confusing. I am not sure what to do about the soles. Hi there, as the reader below indicated, the ladies show is meant to fit a siz 6, so you will want to make the squares almost twice the size. Hope this helps, thanks! I made the ladies version of these not knowing they were too small (about a size 6 ). I wear a 7 1/2. I made several modifications. I added length at the toes, made extra insoles with afghan stitch for more cushion and warmth and I even made "chain" shoelaces. They are super warm & comfy. This was a great little project. I made a pair for my neighbor and her daughter. They absolutely loved them. It only took me about 7 hours to do both of them. I do have to say that I did not use the sole instuctions with this pattern, as it just was not working for me after several attemps. I used a different sole pattern for them. They both turned out really cute and warm!!! Thhank you for this pattern. what pattern did you use for the soles? I also wanted to say that if there is anyone out there that has mastered these slippers, have you written up an easier pattern for these. If so could you send me the pattern I am eager to make these, they look so comfy. Thanks and happy holidays to all. Is there a site with pictures of how to attach the sole? Or a site with a more step by step instructions. I have made granny square afghans but thats it and I really want to learn how to make these slippers but the instructions above are a litttle confusing to me. I cannot figure out how to attach the sole to the slippers. Please help. I made a pair of these and really like them, but I had to fudge a lot. The directions for making the sole were not clear. And it was confusing to have to go to the child's size pattern for some of the rows. It would be better to just include the directions in the adult pattern. Nice slippers, though! I love these slippers. But how do you get 80 stitches on the first round of the sole? This doesn't compute. what's a flat sole seam?